The new Apache helicopter gunships will “play a pivotal role in boosting Taiwan’s combat capabilities and its defensive needs,” according to the country’s president. The Republic of China Army (ROCA) commissioned its first air brigade equipped with Boeing AH-64E Apache “Guardian” heavy attack helicopters on July 17, according to Taiwan’s Ministry of National Defense. The 29 Apache AH-64E helicopter gunships, divided up into two squadrons, are to be operated by the ROCA’s 601st Air Cavalry Brigade, which is part of the service’s Aviation and Special Forces Command. The new helicopters will all be stationed at the Longtan Air Base in Taoyuan, in northern Taiwan. “By stationing the two squadrons in Longtan, the military aims to allow the brigade to intercept an enemy’s landing corps that could make inroads into Taiwan from the north coast,” a Taiwanese military was quoted as saying by the South China Morning Post. “The government will make sure to fully support the military to follow up and further enhance the helicopters’ capability,” Tsai added. U.S. defense contractor Boeing delivered 30 attack helicopters to Taiwan between November 2013 and October 2014. Total acquisition costs were $2.53 billion, which, next to the helicopters, included 1,000 AGM-114L Hellfire missiles and other equipment. One AH-64E was lost when it crashed into a three-story building during a training flight in bad weather conditions in April 2014 leaving 29 to form the air brigade. The first Apache AH-64-E squadron was commissioned last June, the second earlier this year. Over the past four years, Taiwan’s military has struggled to keep the helicopters operational given the country’s wet and high humidity climate. At one point in 2015, only eight A-64Es were airworthy. The rest of the fleet was grounded due to missing spare parts or rust corrosion. The AH-64E helicopter, operated by a two-man crew, is the latest and most advanced variant of the helicopter gunship. The gunship is armed with a M230 30 millimeter chain gun capable of firing up to 625 high-explosive dual-purpose rounds per minute, and can also accommodate up to 16 AGM-114L Hellfire air-to-ground missiles, AIM-9 Sidewinder air-to-air missiles, and Hydra 70 2.75-inch rockets. Additionally, the helicopter is fitted with the powerful AN/APG-78 Longbow fire-control target acquisition radar. The radar can track 128 targets and provides the helicopter with day/night, all-weather, 360 degree search capabilities for both air and ground targets up to a range of 8 kilometers. 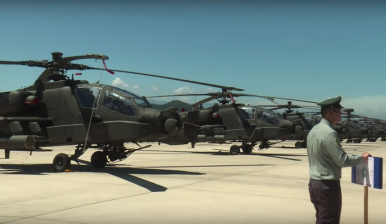 Taiwan’s tropical climate may be too much for the AH-64E Apache gunship to handle.